PCE-SMM 1 humidity meter is very useful for quick and easy determining of the earth humidity. 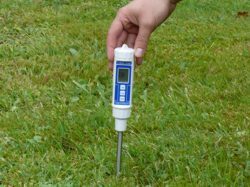 The humidity meter calculates earth humidity within a range from 0 to 50%. Both its compact size and the use of batteries are important for mobile purposes. Besides, its rigid plastic and water resistant housing protects the electronic components of the humidity meter when it is used under adverse operating conditions. 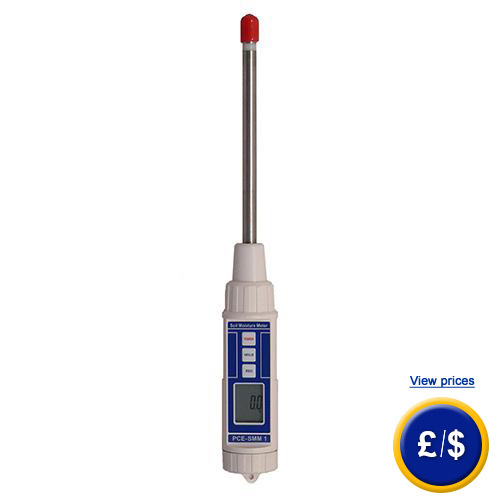 Thanks to the easy measuring principle, this humidity meter can be used by inexperienced people. Hold function and internal memory for max./min. values will make your work easier. If there are any questions about this Humidity Meter PCE-SMM 1, please have a look at the technical specification below or call: UK customers +44(0) 23 809 870 30 / US customers +1-410-387-7703.. Our engineers and technicians will gladly advise you regarding the humidity meters or any other products in terms of regulation and control, or scales and balances of PCE Instruments. 0 - 50 ºC, < 80% H.r. Here you will see the humidity meter when it is calculating humidity in ground. 1 x PCE-SMM 1 humidity meter, 4 x batteries and user manual. If you wish to print a selection from our printed catalogue, click PDF symbol.